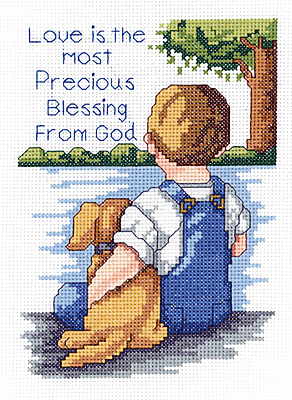 Precious Blessing is a counted cross stitch design by Sandy Garbrandt. "Love is the most Precious Blessing From God". This saying says it all with the little boy and his dog. Contains: 14-count Aida fabric, 6 strand carded 100% cotton floss, floss card, needle, graph, instructions.